When you love, ride and work with horses day in and day out, you tend to get a little dusty and grimy. On a day to day basis that isn’t a terrible price to pay. You spend the day with your horse, get dirty and then go home and have a nice shower. Rinse and repeat the next day. What happens when you and your horse are on the road? Some have the luxury of staying in a hotel or have living quarters trailers with nice, built-in showers. The reality is, many of us don’t. That is where putting a cowboy shower in your horse trailers can really come in handy. What Is A Cowboy Shower? A cowboy shower is a portable shower that you can take on the road with you. Typically it is a shower you setup in your horse trailer (of course, when your horses are not in it). Convenience is the key here, you can quickly and easily take a shower without having to go back to a hotel. Why Put the Cowboy Shower in the Horse Trailer? 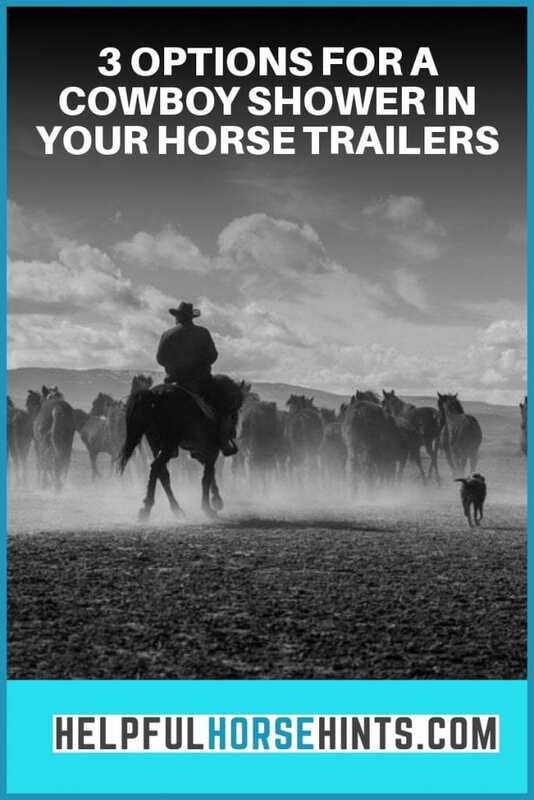 Your trailer is the perfect place for the cowboy shower as long as you don’t use shavings (or have removed the shavings). Thinkg of everything the trailer has to offer. It’s enclosed, large enough to shower on one side and get dressed on the other, and you don’t have to worry about getting it wet. Of course, I suppose if you have a stock trailer you may need to think of a solution for covering up the slats so as not to give your fellow cowboys a peep show! All in all though, the inside of the trailer makes a nice private area to place your cowboy shower. Really, the instructions here can vary based on how simple or complex of a shower you are looking for. A super simple system might just be a bucket of water and a sponge. Or, you may want heated water and a proper shower head. The possibilities are endless and entirely dependent on your time and budget. In fact, my recommendation is to google “camping shower” and you’ll have tons of resources and DIY options to choose from. I’ll list a couple of easy off the shelf options for you here though. For each of these options we are assuming you don’t have easy access to a hose. So, whether you are horse camping with friends or stuck in the back lot of a show ground, these options don’t require a hose connection to work. A basic water pump / shower head combo works great as an emergency backup system. A portable camping shower like the one below takes water from a bucket and pumps it up through the shower head. Keep in mind that the length of your shower is entirely dependent on your water supply. If you have a 5 gallon bucket, that is going to be a quick shower. The great thing about this cowboy shower category is it’s cheap enough to just have on hand even if you don’t think you will need to use it. ▶2018 Upgraded Version: Come with TWO detachable USB rechargeable 2200mAH batteries, separated from the pump. External on/off switch feature, which is an improvement over previous design.No need to immerse the batteries into water,which can protect and enhance the batteries life. ▶Durable and Powerful: We provide two batteries, one can work for up to 45-60 minutes with a full charge ,two for up to 90-120 minutes, which can make sure you will have a constant happy shower.The water flow is up to 4L /min (1gal/min),offers ideal and powerful water pressure to help make bathing easier. ▶Easy Assembly and Operation: Just fully submerse the pump in your bucket/tub of water and turn the motor on,it will pumps water from bucket into steady, gentle shower stream and you get a nice flowing shower. ▶Hands Free Operation: Suction cup and S-hook are included,use the suction cup to securely stick to any flat surface,or use the S-hook to hang it from the tree. ▶Compact & Portable: Weighs only 25.2 ounce,easy to carry and store in luggage,backpack or car trunk,perfect for outdoors,camping,hiking,kid bathing,pet cleaning,car washing, plants watering, windows and backyard cleaning or scouring with sand at the beach. If you are like me, cold showers really aren’t your thing. This solar shower works great during summer. You simply fill the bladder with water and leave it hanging in the sun. A couple of hours later and the water will be nice and warm for your use. The besst part is, the water should stay warm for several hours as long as it is sunny out. Go ride all day, come back, unsaddle and take a quick shower. If you are an evening shower person, this is great for camping. Keep in mind though, that if you have more than one person that needs to shower back to back, best to have a couple of these on hand. Two or three people could share one bag in a camping situation if there was enough time in between showers to heat the water again though! If you have gotten to this section its because you needed a shower option while on the road with your horse but the economical solutions I provided previously didn’t sound all that great to you. You would prefer a heated shower. You have access to either propane tank or electricity on the road and probably have some kind of water storage capability in your trailer. Maybe you are using a portable horse water tank or are OK with keeping a 50 gallon barrel in your tack room for showers. 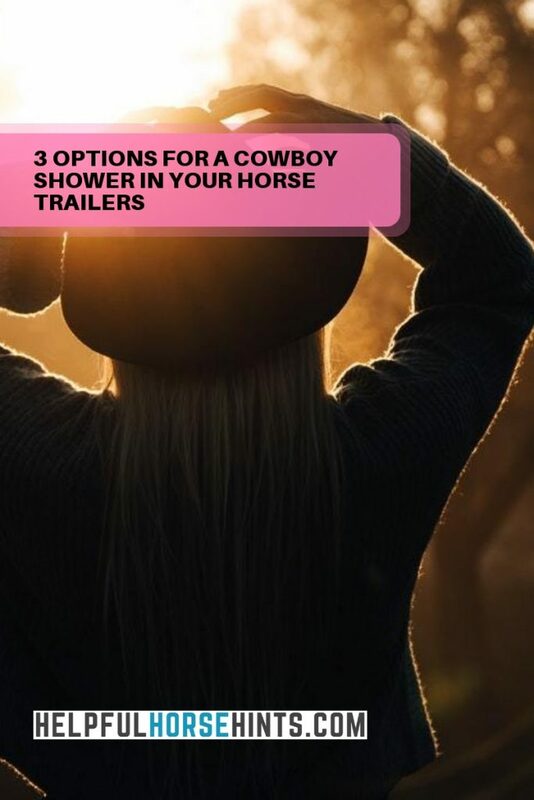 Whatever the case may be, you definitely have options for a more luxurious cowboy shower setup in your horse trailer. The Water Heater Comes with water flow control valve,hose,shower head holder and shower head Important: This is good for shower,but dont provide multi-way hot water supply in the same time. You probably started this project thinking of a way for you to stay clean on the go. I wanted to make sure to cover one side benefit that may help you make a decision. Having a cowboy shower on hand can be a great thing to have if your horse winds up getting injured. I know that isn’t something most of us want to think about but it happens. If your horse gets a cut or gash on the trail, being able to rinse it out properly and doctor it back at the camp site is going to be a great help. Likewise, at a showground setting or just anywhere on the road, having a cowboy shower of any kind would be useful for giving your horse a quick rinse off after a ride or even just to cool down on a hot day where you need to spend lots of time on the road. Hopefully this situation doesn’t come up too often but it is a side benefit! Having a cowboy shower helps equestrians everywhere stay clean on the road. There are many different ways you can setup a cowboy shower system in your trailer. We’ve covered the basic pump in a bucket setup, the solar shower and the tankless water heater. Each option is portable and convenient. Which one will you choose?